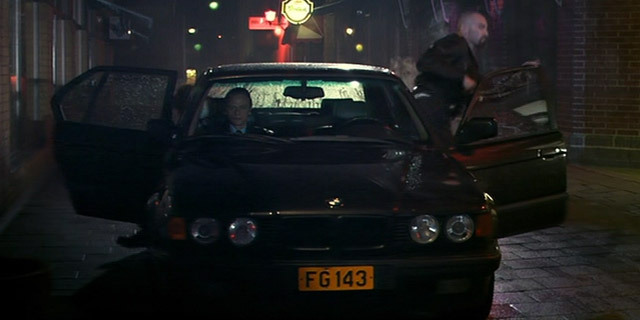 IMCDb.org: 1989 BMW 7 [E32] in "Den tredje vågen, 2003"
How odd looking. The kidney grille almost looks like a late E34. Strange to see it blacked-out. It also appears the chrome on the doors are blacked-out too. Most likely after-market mods. Very few Euro spec. E32 BMW's were equipped this way - typically they were derived from Alpina or Hartge. V8 or V12 because of wide kidney-grill. I think 750iA. Somebody just "tuned" the kidneys in black. I think the car is Shadowline-edition, that explanes missing chromes.